This item has been discontinued and has been replaced Inmarsat iSatPhone 2 Satellite Phone. This new has many feautures such as SOS button, Military top rating IP 65, GPS tracking, pageability, calls can be recieved with antenna stowed, and faster registration time to the satellite. 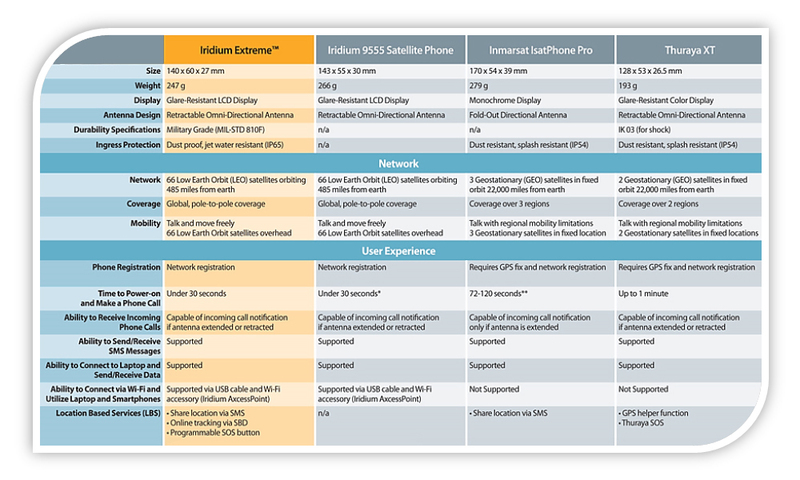 Below is the comparison chart of the most common satellite phones;This chart can help you undestand better the functions, features, specifications and network registration of each of the satellite phones. This phone is a value priced sat phone, with reliable connectivity. This is the cheapest price I could find them at, and the customer service was terrific! Great follow-through making sure I had the right phone, and am happy with it. Thank you. Purchased this phone last summer for offshore fishing in New Jersey . We do 100 miles offshore trips for Tuna and we needed a phone in the event of an emergency and to call home and talk to my family. Phone performed perfectly. Works well with regular headphones . Had no problems getting signal. Jeremy was always available when I have called. I highly recommend for offshore fishing. Click the button below to add the Inmarsat IsatPhone Pro Satellite Phone Kit to your wish list.